John Irving, Gabriel Garcia Marquez, and Alex (My Former Boss) – The Bookshelf of Emily J.
I had never heard of John Irving until my boss Alex told me about him. I was 21 years old at the time and working as a secretary after graduating from college. (Yes, that’s how good of a job you’ll get with a B.A. in English.) Alex noticed that I always had a book with me (usually for the bus rides, but sometimes for my lunch hour), so he began to suggest books to me. 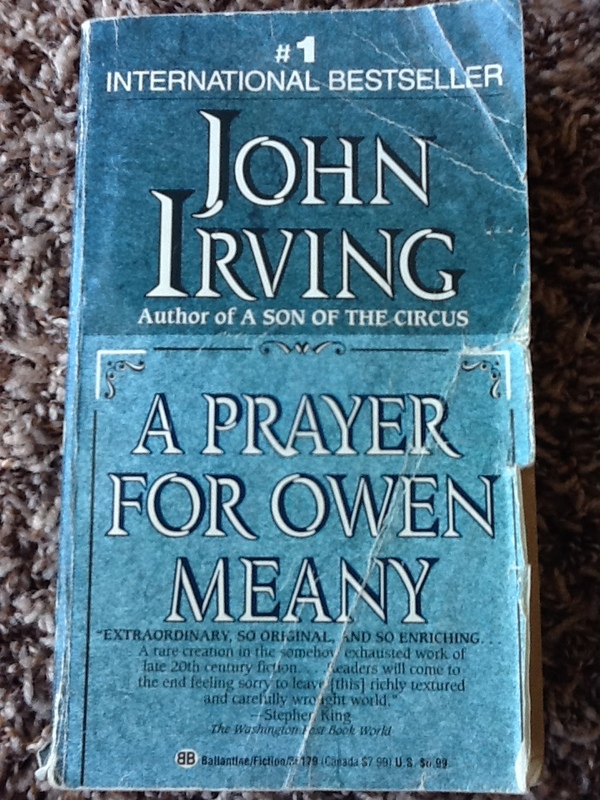 In fact, he allowed me to borrow some of his books, and the two that I remember borrowing were A Prayer for Owen Meany by John Irving (number 44 on the BBC book list) and One Hundred Years of Solitude by Gabriel Garcia Marquez (number 43 on the BBC book list). Owen Meany has an intricately crafted plot. The book is fantastically better than the movie, as is usually the case. When I realized that I had seen the movie as a teenager, I couldn’t believe it was the same story. The movie is Simon Birch. Maybe you remember it. I remember it. It was sweet. It was touching. It was boring! Irving’s novel is far from boring. And the name Owen Meany is far more fitting than Simon Birch. The most significant part of the novel, Owen’s heroic actions during the Vietnam War, is completely left out of the movie. The most serendipitous part of Owen’s heroism is the fact that he has practiced these actions his entire life. It involves “the shot” with a basketball hoop; Owen’s best friend John lifts him up, as they did when they were children, to throw a live grenade out of a high window, saving a roomful of Vietnamese children, but killing Owen. Owen has practiced because he is some kind of seer; he knows and has always known what he is meant to do in life. This is the entire point of the novel – that we all have a purpose in life, and if we are as savvy and humble as Owen, we might just realize what that is. Owen has some disabilities, yet he is still able to complete his purpose in life, although it requires giving his own life for others. How many of us would be willing to do so? How many of us would – if we knew dying would be required of us – practice for this eventuality? I’m not sure that I can answer that affirmatively. 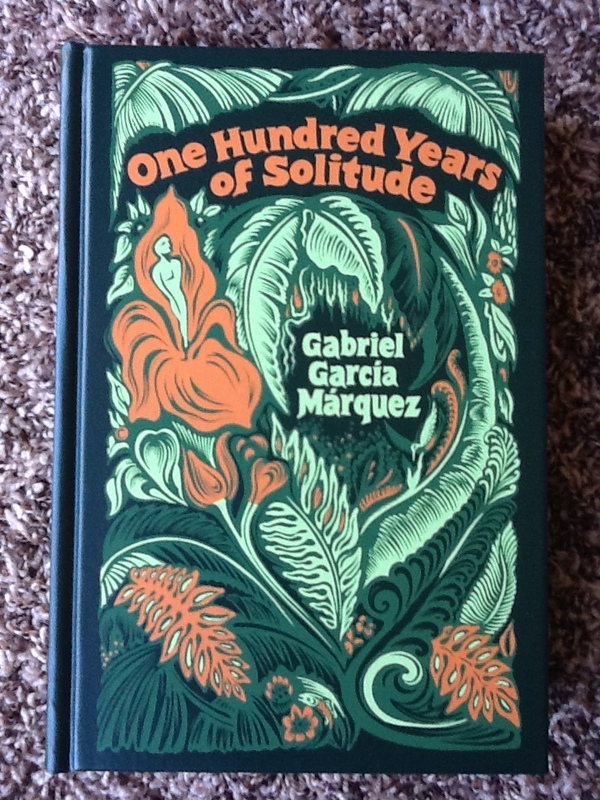 The other book Alex encouraged me to read is One Hundred Years of Solitude by Gabriel Garcia Marquez. I had enjoyed Garcia Marquez’s short story “A Very Old Man with Enormous Wings,” and I had read The Autumn of the Patriarch, but I had never yet attempted his masterpiece. However, because Alex gave me his copy, complete with an embossed page proclaiming the book to belong to Alex, whose middle name is Maximillian (really), I read that book with dedication. I spent 40 minutes on the bus in the morning hunched over it. I spent 40 minutes in the evening hunched over it. After dinner, my husband studied for the CPA exam. So, I angled the couch with the dining room chandelier in prime position to light my reading while I sprawled out with the book on my stomach. I read for two or three hours straight each night. I can’t remember how long it took me to finish, but it was probably between one and two weeks. I returned the book to Alex proudly, hoping he’d quiz me on the specifics or that we’d have a momentous conversation about its magical realism. I don’t remember if we did, but I do remember loving that book. During every moment of the absurd happenings in Macondo, I was reminded of the symbolism and magical realism of “A Very Old Man with Enormous Wings,” but I also found myself comforted by the strangeness of this family. My family growing up was strange. My parents were divorced when I was six. My mom remarried quickly to a man who had debts and addictions. My mother and he constantly fought, so much so that the police were called several times. I often felt as if my family did not belong in the tiny, rural town to which we moved. We lived two states away from my cousins, my grandparents, and my dad. It seemed that everybody in this new town had extended family. We did not. My step-father also tended to make a fool of himself publicly, and often the rest of us suffered because of it. It was an unhappy childhood, one I often wish had been a dream. In those dream-like pages of Garcia Marquez, I realized that my family was strange, but that so were many other families. Patriarchs were not always picture perfect. I’m glad Alex recommended these two books to me. He opened my eyes to the talents of John Irving, and he motivated me to read Garcia Marquez’s true literary masterpiece that may have been returned to the library after a chapter or two if I hadn’t wanted to so badly to impress him. Now, a decade or so later, I look back fondly on those hours of reading on the bus to and from my secretary job. However, I now regret the bulging disc in my neck as a result of hunching over books for so long. Take my advice. Read sitting up with a pillow on your lap to hold the book closer to eye level. That’s how I read now to prevent any further neck distress! When you were describing One Hundred Years of Solitude (one which I have added to my list) I had this thought of another book called I Know This Much Is True by Wally Lamb which is a amazing tale of twin brothers; one who his schizophrenic and the other who fears that he may be and their story of growing up in a crazy family. Mr. Lamb also wrote She’s Come Undone in which he gained fame because of his incredible ability to write in the frame of an obese woman who decides to take charge of her life (I never read this one). It is a book not to be missed! I will have to give 100 years of solitude another go – I own it, and tried reading it aloud to my husband years ago, but he was driven crazy by the repetition of the main characters name in the early chapters, so I gave it up. A lame reason to stop reading something, but that’s how it is. 🙂 I loved Love in the Time of Cholera, so I know I should go back and give the award winner another shot! One Hundred Years of Solitude was hard for me to get through the first time as well, but every moment of reading that book was all worth it when I read the last line. For me that was magical and it cemented my love of Marquez. I should really re-read it. Pingback: Things Baby Books Should Tell You But Don’t « The Bookshelf of Emily J. One Hundred Years of Solitude is a wonderful book. It made me reflect on my heritage too. It’s been a while since I read it but I remember having a sense of questioning, how much of our heritage comes with us as we move through time and generations. I must read it again. And thanks for the neck tip, I’m terrible with my reading posture. Yes, read sitting up straight with the book at eye level. You do NOT want neck problems. They are a big pain . . . in the neck! ha ha. Thanks for visiting my blog! I had a great time here. I stopped reading last year. I was having a really bad time with work. I lost my ‘mojo’. But it’s coming back and seeing your list has made me excited about picking up a book. Glad I found you too. As a Colombian I revere GGM, and even though I believe his most recent work has slipped, his writing is extraordinary. Try reading some of his non-fiction works, they are even more enthralling, if possible. 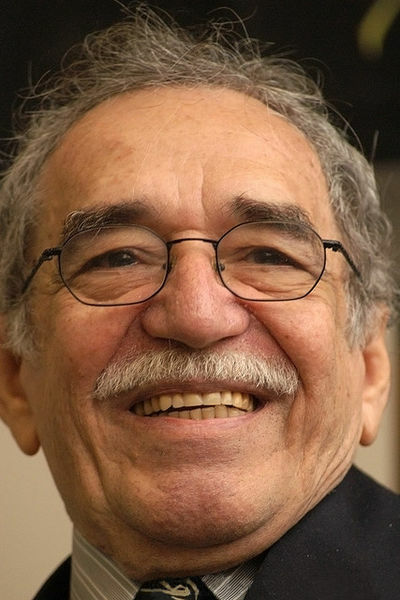 Yes, Garcia Marquez is fabulous! I wish I have such generous, well-read bosses! I tell this to everybody I know. Whenever you have a person who you can discuss a book with, who encourages you to read there’s nothing more one should ask for 🙂 That way I must say you have been very fortunate. I am also truly inspired to read these books very soon. And thank you for that reminder about the posture. I think it’s very important because most of us bookworms are so engrossed in the world within the cover that we lose sight of our health concerns. I was very lucky to have him as a boss and to have him as a friend now! Pingback: World Literature and Othering | The Bookshelf of Emily J.
Pingback: Books I Have Two (or Three) Copies of | The Bookshelf of Emily J.
Pingback: No One Ever Taught Me to Be a Housewife | The Bookshelf of Emily J.
Pingback: The Best Revenge: You’re Living Well, Elizabeth Smart | The Bookshelf of Emily J.
Pingback: My Favorite (And Least Favorite) Words | The Bookshelf of Emily J.
Pingback: On My Bookshelf, No. 5 | The Bookshelf of Emily J.